And in clear language using compelling logic rooted firmly in the Constitution, they detail why the time to start is now — not in the indefinite future after criminal investigations have ended. In fact, much of Trump’s impeachable conduct lies outside the scope of ongoing federal criminal investigations. 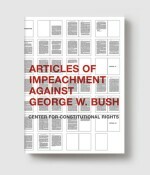 Citing charges such as accepting illegal payments from foreign governments, using government agencies to persecute political enemies, obstructing justice, abusing the pardon power, and undermining freedom of the press, they provide the factual and legal basis for eight articles of impeachment. 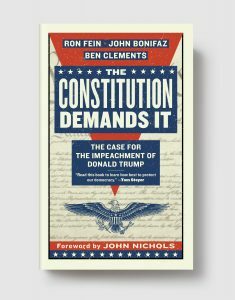 In short, they argue, abuses threatening our constitutional democracy should be dealt with by the remedy that the Constitution provides for a lawless, authoritarian president: impeachment. And an informed citizenry should be part of the process. After all, they say, impeachment is not a constitutional crisis — impeachment is the cure for a constitutional crisis. RON FEIN, Legal Director for Free Speech For People, is a constitutional lawyer who previously served as Assistant Regional Counsel in the U.S. Environmental Protection Agency, where he received the National Gold Medal for Exceptional Service. He appears regularly on television and in the op-ed pages of the Washington Post, commenting on constitutional matters. JOHN BONIFAZ is the co-Founder and President of Free Speech For People. He previously served as the Executive Director and General Counsel of the National Voting Rights Institute, and as the Legal Director of Voter Action, a national election integrity organization. A distinguished attorney, he has been at the forefront of key voting rights battles across the country for more than two decades, and is a winner of a MacArthur Foundation Fellowship Award. BEN CLEMENTS is the Chair of the Board of Directors of Free Speech For People and Chair of its Legal Committee. He is also a founding partner of the Boston law firm, Clements & Pineault, LLP. His clients have included state and federal governments, candidates for state and federal office, senior public officials, large corporations, and small businesses. He is a former federal prosecutor and former Chief Legal Counsel to Massachusetts Governor Deval Patrick.